There seems to be no stopping Joel Makin as he takes out yet another higher seed to make his maiden Platinum level quarter-final here at the Qatar Classic. The 24-year-old beat France’s ex-world number six Mathieu Castagnet in an entertaining match that unfortunately ended with the Frenchman retiring due to injury. Makin had a great start to take the first two games, but a small lapse of concentration in the third at 6-6 onwards saw the game slip away. While Castagnet won that game, it certainly did a lot of damage on his legs as he seemed to struggle in the fourth, which he eventually conceded at 3-8 down. It was his right calf once again that was troubling the Frenchman, who was clearly frustrated as he left the court. “Yeah it’s massive! To back this up after the tough match yesterday. I am happy I still managed to play the way I played – controlled the pace. Happy to get through. I got my lengths right in the first two games and got in front of him, and he wasn’t working me much. But in the third game, he was attacking a lot more and he was in a lot more control. I think it was the pressure and the cumulation from yesterday’s game, so my legs were a little bit heavy. I came back in the fourth feeling a lot better,” Makin said later. Kiwi Paul Coll made his first quarter-final of the Qatar Classic after Spanish Borja Golan retired at the start of the third game with an injury. Coll had taken a 2-0 lead after coming back from 5-8 down in the second. The third game had just started with two short rallies and in the third, Golan appeared to have slightly tripped over Coll’s leg. He went over and shook the world number eight’s hands. Speaking to Golan much later, the Spaniard revealed that he felt a pull in his left quadricep, which has in recent years been problematic. He did not want to risk further injuring it and decided to call it quits. “I’m very happy (to be in the quarters). I’ve always enjoyed the tournament here. They look after us super well. It’s a shame – the circumstances (how) I got to the quarter finals. I’d rather win a 100-minute battle than to win like this. But I’m loving the tournament and I’m enjoying it,” Coll added later. 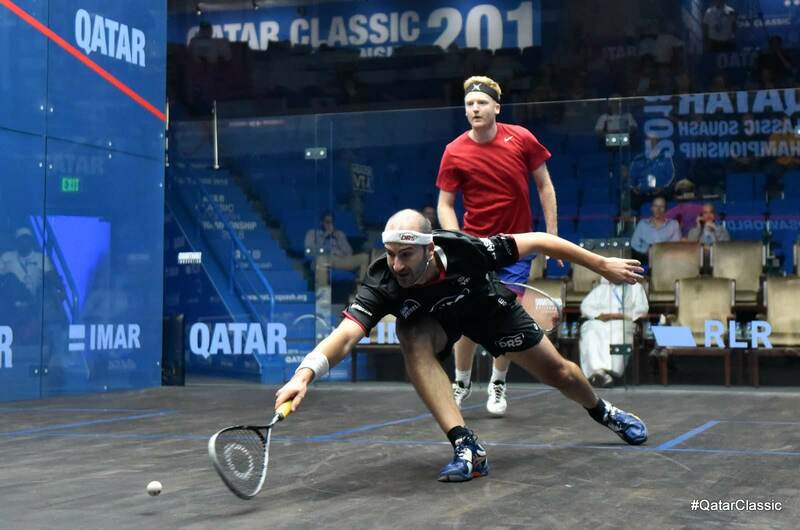 Despite not being at his best, Simon Rosner ended the run of England’s Tom Richards in the last sixteen today. Rosner started brilliantly with his high paced game and raced into a 4-0 lead. Richards pulled back to 4-3 and the Rosner then went 7-4 ahead once again. Richards played brilliantly in the next few rallies, working the German around and was rewarded with a 3-point streak to come within a point at 7-6. The game was close from hereon, but the experience of Rosner carried him through to take the lead. Rosner was dominant in the second, winning 11-5. The German “Tree Chopper”, as he is known on Squash TV, seemed to have had lapses of concentration at certain points of the match. This was evident once again in the third and fourth game. Richards manages to sneak in a game in the third, but some bad shot selections in the fourth cost him a fighting chance in the fourth and the match. “It’s a bit weird today to be honest. I was feeling good in the beginning, but suddenly I kind of felt like I hit a wall a little bit. I felt flat and Tom played some good squash, putting me under a lot of pressure by taking the ball early. I was more behind of him than in front, and that is not my game. I was trying to find the quality in my shots to get him into the corners. 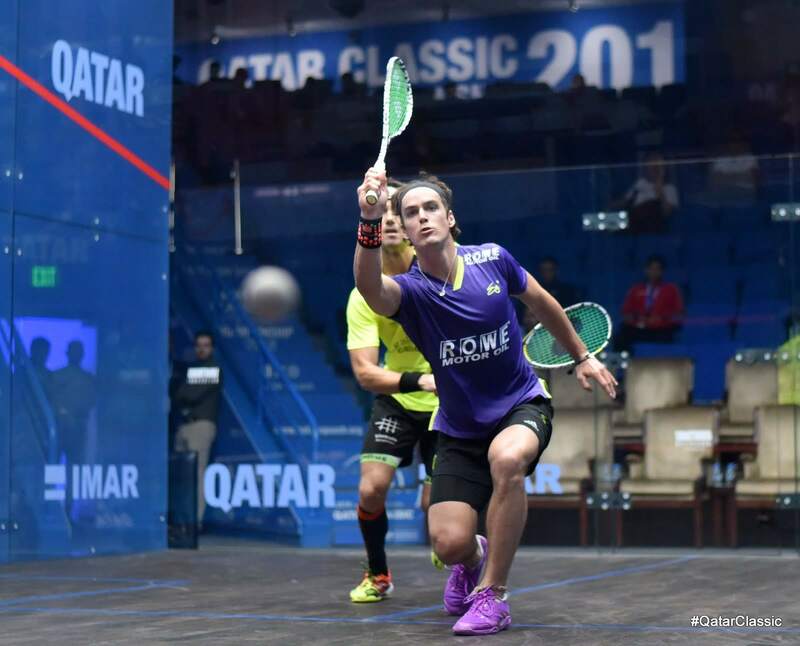 It was a bit of a weird match, but overall, I’m happy with how I dealt with the situation,” Rosner said of his match. The match-up between Diego Elias and Mazen Hesham had a lot of promise of an explosive affair, but it never lived up to its billing. Right from the start, the Peruvian was in control and pretty much contained the dangerous Egyptian by keeping the ball tight at the back, never allowing Hesham much room for his flair. “I’m very happy I played well today. I’m feeling good. Last year after this tournament, I got injured and I was having a hard time. But now I’m feeling good again and making the quarters. I had to prepare well because I know Mazen has every shot, so I just kept it tight at the wall,” Elias said after the match. In the last match of the earlier session, world number one Mohamed ElShorbagy was clinical in stopping the run of Adrian Waller, the lefty from England. Waller had in the earlier round played brilliantly to beat Omar Mosaad very convincingly. He showed moments of that brilliance once again here, particularly in parts of the first and third games, but was simply unable to match the consistency of the Egyptian. “It was a tough match. In the first game, he started better and he was controlling me a bit, but it got better after. I had to play a little faster, rushed him more and I managed to force some errors out of him. It’s nice to get away from this 3-0, like Diego. 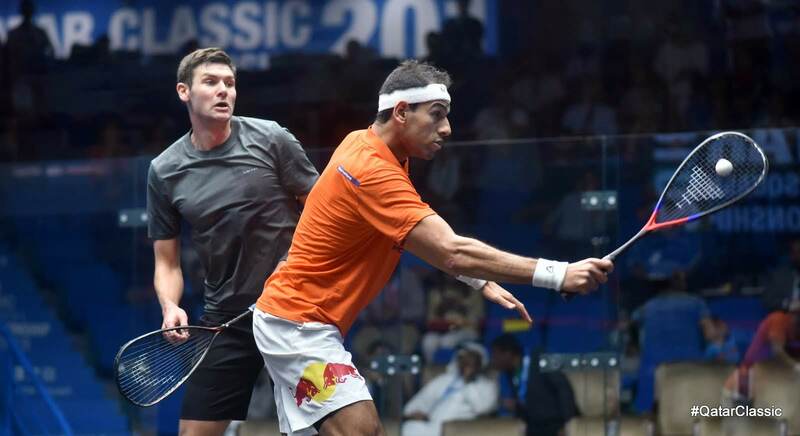 We will both be fresh for tomorrow,” defending champion and world number one Mohamed ElShorbagy said after. Opening up the evening session of play was Tarek Momen, the current man on form, after he won the Channel VAS Championship last week. His opponent, the 2005 Qatar Classic champion, James Willstrop. It was a great match in a way. Willstrop took the first game with his trademark marksman-like drops to the front. 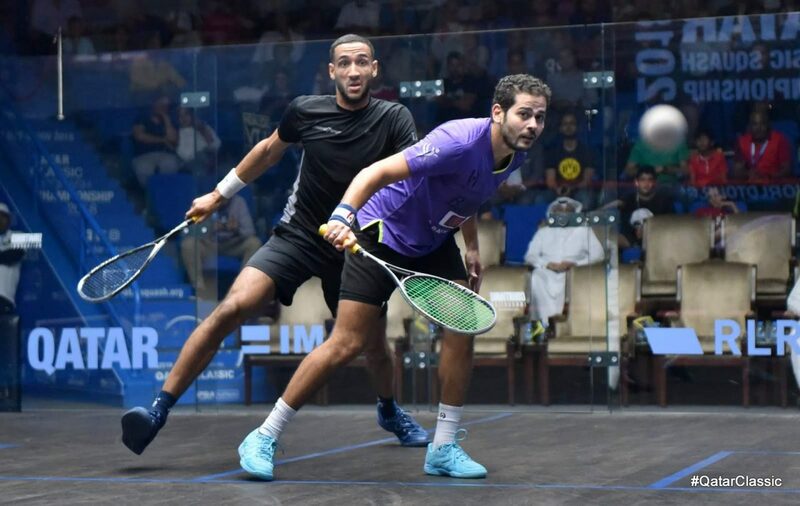 But what happened in the next two games was a sheer display of supremacy, accuracy and agility from Tarek Momen, the world number four. There was nothing that Willstrop did wrong, but Momen just got everything perfectly right. Momen’s floating backhand volley drops were hit with such extreme accuracy through these two games and that won him many points. It has to be said the score line of 11-0 and 11-1 certainly does not do justice to the quality of the rallies in those games. While Momen won 22 of the 23 rallies, they were certainly no walk in the park. Willstrop manages to contain the onslaught in the fourth to an extent to make it competitive, but the man on fire was just far too good today. Tarek Momen. “Nothing to say except he played really well and he was just far too good. I was pleased with my game. Even when I was getting beaten, it didn’t feel like it was a disaster. Credit to him, he was just playing so strongly. I didn’t do anything particularly wrong. That’s why he’s one of the best players in the world today,” Willstrop said of his game and opponent after. 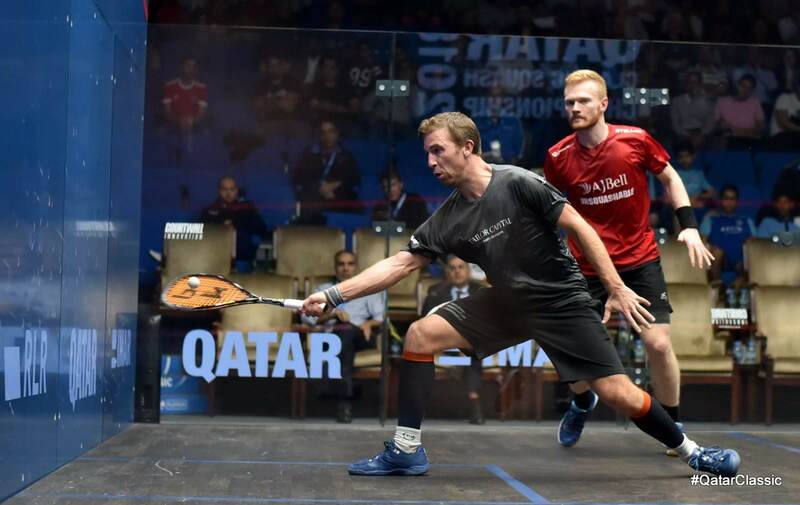 Momen, meanwhile, added, “I try not to think of the score, but squash-wise, I felt it was a decent game. It was a highly contested games, the first and fourth. It’s just that my shots were a little more accurate in the second and third. My lengths were a little more effective, and that created more chances for me to attack. The score doesn’t reflect the way the match was going. Until the last point, I was always on the edge. I know James, and he can always come back. I’m just glad I was able to close it out in the fourth,” a relieved Momen added to what Willstrop said. 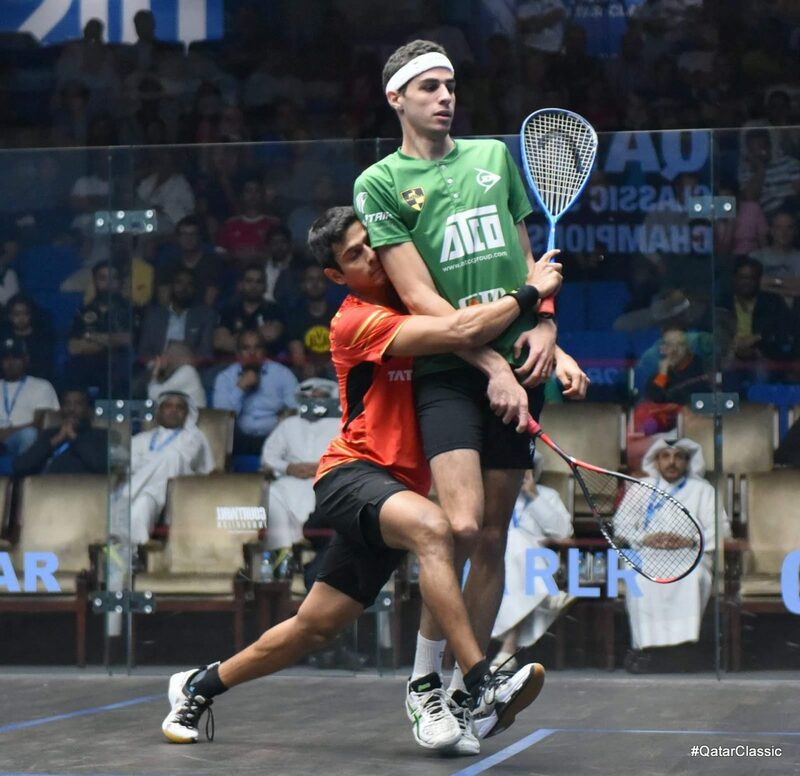 2016 champion Karim Abdel Gawad once again pulled off another five game victory, this time over the towering Declan James, the world number 20. After coming from two games down yesterday, history nearly repeated itself after James took the first and the score was locked at 9-9 in the next. But Gawad managed to squeeze through and what a finishing rally it was – as James’ heart rate shot above the 200 mark. In the third, James lost an 8-5 lead after he found the tin four times in a row and eventually lost the game. He worked hard to take the fourth, but in the decider, it was clear he wasn’t as comfortable physically any more and won just two points. “Most of my matches are 3-2 and of course I’m happy to get through again. It’s tough having two five-setters in two days. Luckily I have my physio here with me. Hopefully tomorrow, I will be ready for another match,” a relieved Gawad added. The final match of the day saw second seed Ali Farag overturn a deficit in the first game to beat Saurav Ghosal in straight games. 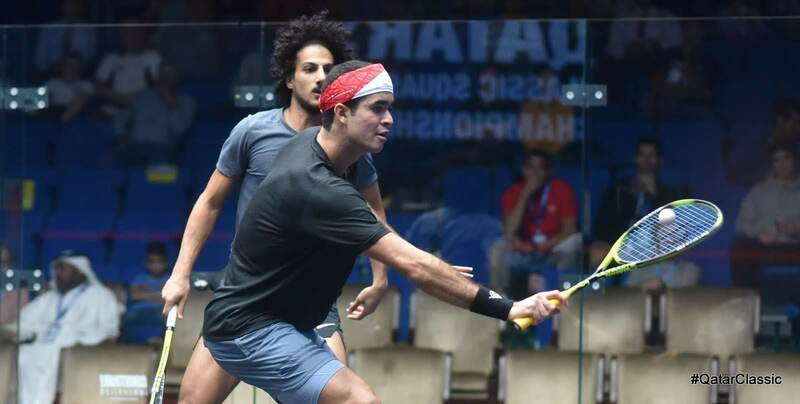 It was close in the first, until Farag seem to have found his way at 7-10 down. He was dominant from hereon and went on to win in just under 40 minutes. “I don’t think it was a slow start. Saurav just played really well. He was standing in front of me all the time and I had trouble finding my rhythm to get in front. Then when I picked up the pace, I was able to dictate a little more, and I began to feel more comfortable.